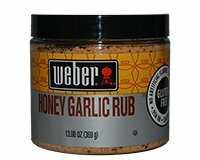 Weber Honey Garlic Rub combines the natural sweetness of honey mixed with garlic and sweet chili peppers. Use Honey Garlic Rub to impart a sweet and savory flavor to grilled chicken and pork. Contains No Artificial Flavors. No Artificial Preservatives. No MSG. Gluten-Free. Directions: Rub about 2 tbsp of Weber Honey Garlic Rub per 1 pound of chicken or pork. Let stand a few miunutes to allow flavors to penetrate the meat. Grill or barbecue as desired. Cross Contamination Warning: After handling raw meat, always wash hands before using this product. Best practices are to measure seasoning before handling meat. Ingredients: Sugar, Garlic, Salt, Brown Sugar, Chili Pepper, Spice, Honey, Soy Sauce (Soy Beans, Salt, Vinegar), Rice Concentrate, Vinegar. Allergy Information: Contains Soy. Weber®, the kettle configuration and the kettle silhouette are registered trademarks of Weber-Stephen Products LLC. Used under license. All rights reserved.